Costume Design Sketches from "Far From the Madding Crowd"
Get ready! A wonderful period costume drama is soon to be released on DVD for those who love films set in the 19th century and the delicious costumes that go with them. But before you sit down to lose yourself in this delicious adaptation of Thomas Hardy’s Far From the Madding Crowd, enjoy this set of costume design graphics from the making of the 1800s period film. 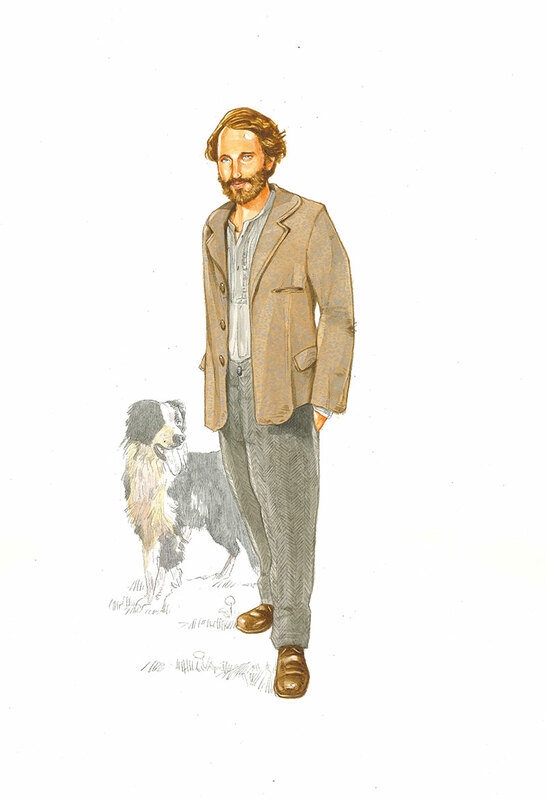 The concept of these graphics is "from sketch to screen" as each sketch comes with a corresponding photo of the finished costume from Far From the Madding Crowd. 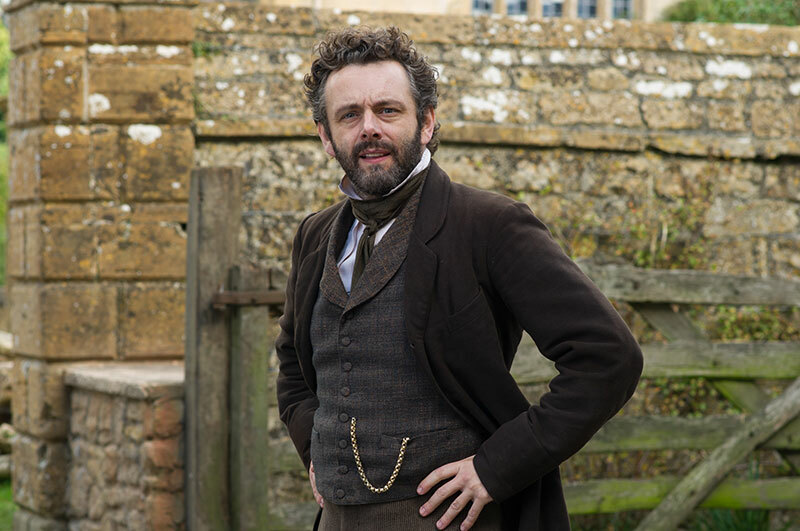 William Boldwood (Michael Sheen), a prosperous and mature bachelor. This timeless story of Bathsheba’s choices and passions, while trying to maintain her own independence, explores the nature of relationships and love – as well as the human ability to overcome hardship through resilience and perseverance. The pastoral beauty and sly humor that characterize Bathsheba has kept Hardy’s novel one of the most popular of all time and, although written 140 years ago, the book’s spirited heroine is sure to enchant a new generation of fans. The story has inspired an abundance of stage and film adaptations throughout the years since its publication in 1874 – the last time this Hardy work was filmed for the screen was for John Schlesinger’s 1967 hit starring Julie Christie. Carey Mulligan as "Bathsheba Everdeen" in Far From the Madding Crowd. Photos by Alex Bailey. © 2014 Twentieth Century Fox Film Corporation All Rights Reserved. Watch it now on Digital HD, Blu-Ray and DVD. Available here. How much can you tell about a character such as Bathsheba from their clothing? Quite a lot can be discovered through costume design and wardrobe choices without a word of dialogue. Essential to developing the characters of Bathsheba and the men who try to win her hand were the costumes created by Janet Patterson, four times Academy Award nominee, who also designed for Bright Star (2009), Oscar and Lucinda (1997), The Portrait of a Lady (1996), and The Piano (1993). 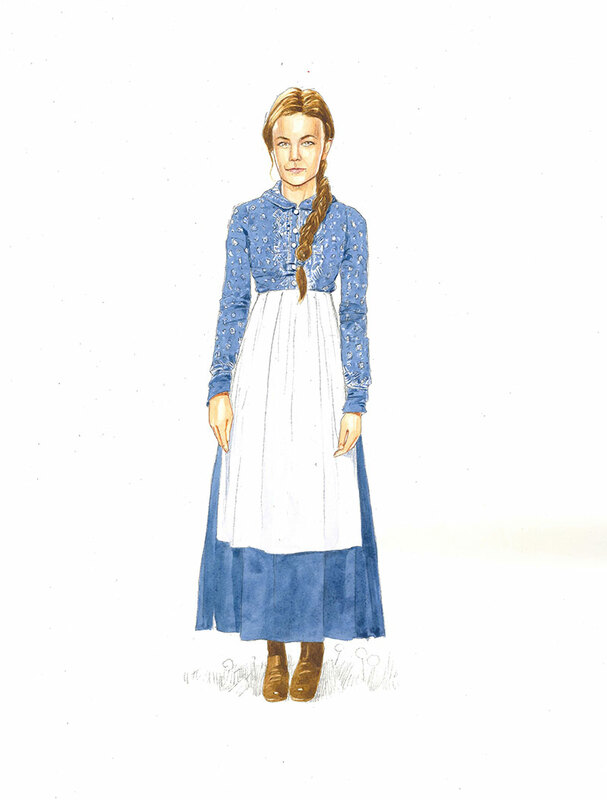 Below, her sketches will demonstrate the lines and colors that were later realized in the film’s costumes. For all the period costume enthusiasts and Hardy book lovers, yes we notice the discrepancy in costuming. Although the book is set in the 1870s, the film’s fashion styles are from the 1880s. The director, Thomas Vinterberg, wanted to “avoid the crinolines and bustles associated with Victoriana, so he moved the story’s action to 1880, when fashion suddenly turned to a sleeker, more modern silhouette – one more befitting a woman who rides, climbs ladders and jumps into the sheep dip.” Disappointing but acceptable … except when actress Carey Mulligan rides into the scene wearing an unlikely leather jacket and leather pants. 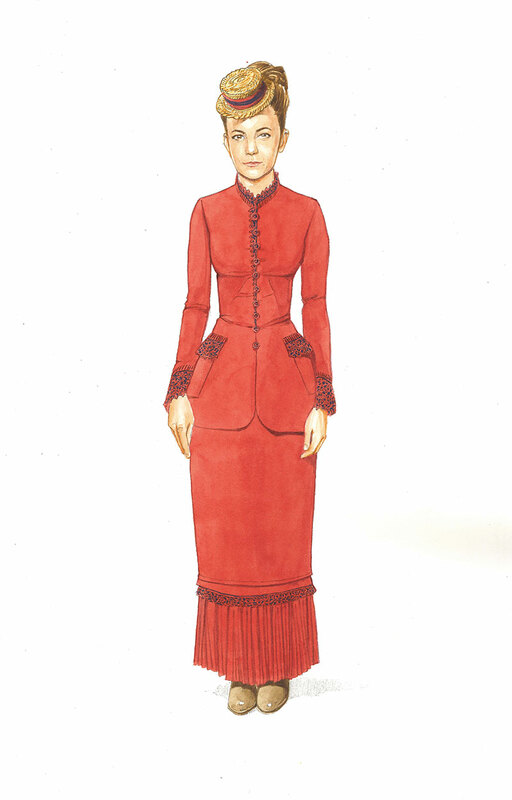 Costume Sketch: bathsheba Everdeen. ©2014 Twentieth Century Fox Film Corporation All Rights Reserved. Watch it now on Digital HD, Blu-Ray and DVD. Available here. 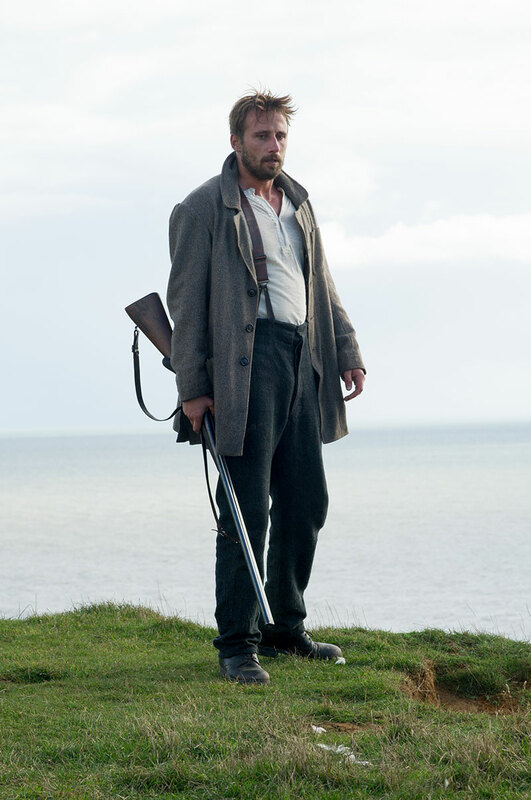 Matthias Schoenaerts as "Gabriel" in Far From the Madding Crowd. Photos by Alex Bailey. ©2014 Twentieth Century Fox Film Corporation All Rights Reserved. Watch it now on Digital HD, Blu-Ray and DVD. Available here. Costume Sketch of Gabriel Oak. ©2014 Twentieth Century Fox Film Corporation All Rights Reserved. Watch it now on Digital HD, Blu-Ray and DVD. Available here. Each of the characters has his or her own journey in terms of costuming: Gabriel moves from landowner to a ragged itinerant worker back to affluence again. Through his clothing, Gabriel brings to mind an old fashioned type of masculinity in rough peasant garb: strong, quiet, with a visceral relationship to the earth, a man you could see scything, tilling, building fences and herding sheep. Men in his position, dressed in cheaper versions of city fashions, made of fabrics designed to keep out the wet and the cold. Carey Mulligan as "Bathsheba" in Far From the Madding Crowd. Photos by Alex Bailey. © 2014 Twentieth Century Fox Film Corporation All Rights Reserved. Watch it now on Digital HD. On Blu-Ray and DVD August 4th. Available here. The heart of the costuming work for Far from the Madding Crowd was Bathsheba. Her clothing was divided into three distinct phases: her impoverished phase when she’s a simple farm worker; her life as a businesswoman trying to be taken seriously after she inherits the farm; and her more mature phase when she becomes a married woman only to nearly lose her identity and joyfulness. 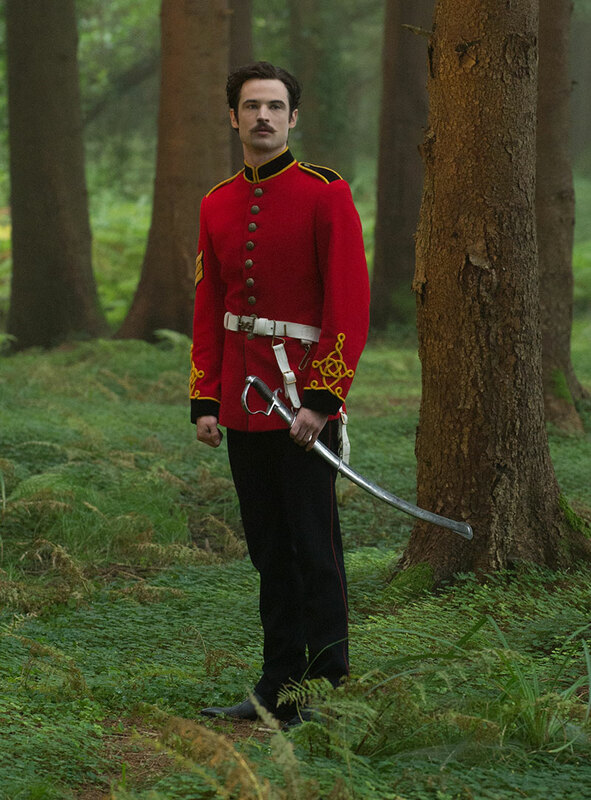 Tom Sturridge as "Sergeant Troy" in Far From the Madding Crowd. Photos by Alex Bailey. © 2014 Twentieth Century Fox Film Corporation All Rights Reserved. Watch it now on Digital HD. On Blu-Ray and DVD August 4th. Available here. Gabriel might be Bathsheba’s rock, but Sergeant Troy (Tom Sturridge) is the first one who manages to steal her heart with a lusty initial encounter. 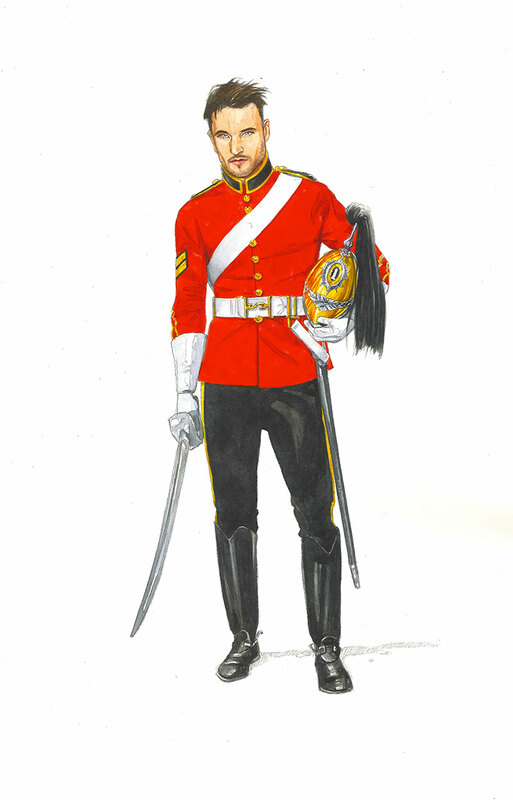 The character is introduced outfitted in a scarlet military uniform of the Dragoon Guards and later progresses to a fashionable man of leisure dressed in stripe suits. Full of charm and flattery, but also fickle, entitled and conceited, he leads Bathsheba down a darker path – for a while. Sturridge was drawn to play Troy as someone he sees as not really a villain but a man who behaves badly because he is so captive to his own whimsical heart. Costume Sketch: Sergeant Troy. ©2014 Twentieth Century Fox Film Corporation All Rights Reserved. Watch it now on Digital HD, Blu-Ray and DVD. Available here. The seductive, handsome and reckless soldier, Sergeant Troy, wears a military uniform featuring a bright scarlet loosely cut tunic with gold trim. Troy is a dominant character as Bathsheba decides which partner to choose and how to hold her own in a male-dominated world. Michael Sheen as "William Boldwood" in Far From the Madding Crowd. Photos by Alex Bailey. © 2014 Twentieth Century Fox Film Corporation All Rights Reserved. Watch it now on Digital HD. On Blu-Ray and DVD August 4th. Available here. Bathsheba’s third suitor is her most prosperous, and the one who offers her the most in terms of long-term safety and stability: the wealthy but emotionally stunted landowner William Boldwood (Michael Sheen). He starts off as this man who’s made a decision to spend his life alone, but once Bathsheba rashly makes him notice her, she becomes his sole reason for living and you can see the cracks start to form in his personality, until he just sort of disintegrates. 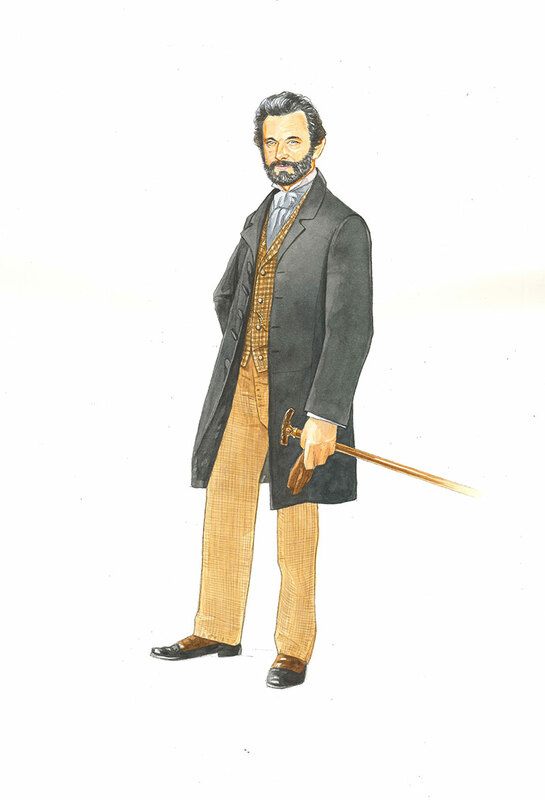 Costume Sketch: William Boldwood. ©2014 Twentieth Century Fox Film Corporation All Rights Reserved. Watch it now on Digital HD, Blu-Ray and DVD. Available here. Although Boldwood’s money and position would warrant clothing tailored specifically for him, his heavy suits and beard reveal his disinterest in appearances. He lives in a very controlled environment in a spacious but empty mansion [filmed at Claydon House, Buckinghamshire] where everything needs to be perfect, and where the rooms are so vast that they magnify his isolation. 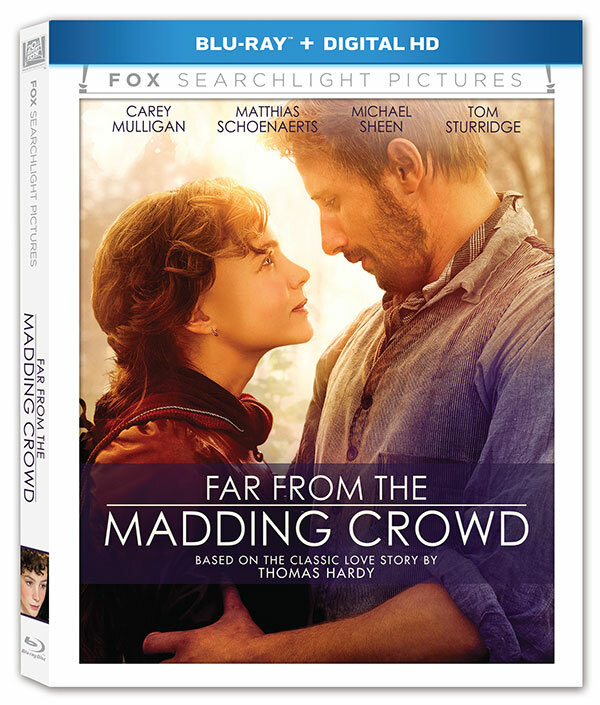 The Blu-ray version of Far From the Madding Crowd includes must-see special features. An extended ending and these deleted scenes: Fanny and Troy at Barracks, Valentine Inquiry, Boldwood Learns of Elopement, Troy and Bathsheba in the Morning, Tears of Regret, Boldwood’s Ring, Troy’s Funeral, and The Wedding (Alternate Ending). 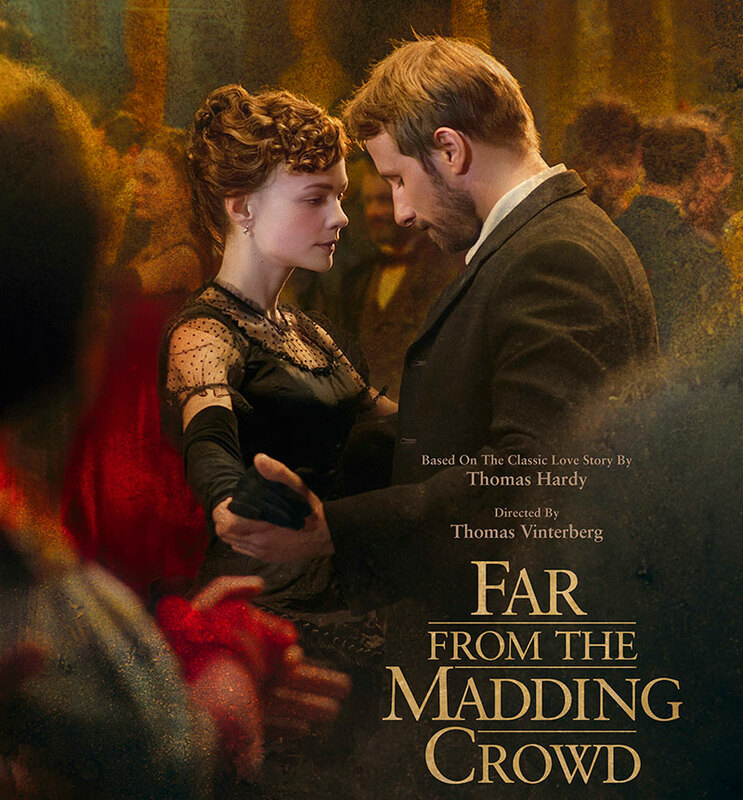 Plus in-depth features on Locations of Far From the Madding Crowd, Bathsheba Everdene, The Suitors, Adapting Far From the Madding Crowd, The Look of Far From the Madding Crowd, Gabriel Oak, William Boldwood, Sergeant Troy, and director Thomas Vinterberg.